There were actually several versions of the so-called C64G. This particular one in the top left photo is actually one of the later versions from the end of the 1980s and probably the one I could have chosen when I bought my original C64 in 1989. It has the same keyboard and mainboard as the C64-II, but instead of the flat case it has the original breadbox shape in a brighter beige colour. Apparently Commodore did not want to go back to the brown colours of the early 1980s, because the old colour scheme did not match the available hardware like the 1541-II floppy drive. I acquired this C64G in about 2004 from Ebay and it worked perfectly, although the plastic, especially on the keyboard, had yellowed visibly. But this is actgually perfectly normal, since my own C64-II exhibits exactly the same visual aging – there are only few C64 of this production line that have not discoloured. The first version of the “new” C64 breadbox with the brighter case was actually sold in Germany starting in 1987 by the discounter Aldi and hence became known as the Aldi-C64, although it was also available from other stores and mail order companies like Quelle and Neckermann. 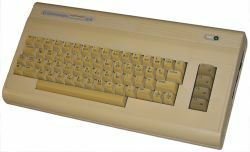 The first versions had the same early beige keyboards as the C64-II with the graphics symbols printed on the front of the keys, sometimes even the original brown keyboard was used – but the mainboard used was always the newer, more compact one. After the Aldi-C64 was sold out, the C64G was produced starting in about 1988. It had the newer keyboard with all symbols and letters on top of the keys and was sold partly in the old packaging or as a Video Supergame 64 bundle containing the computer itself, a joystick and a module with three games, none of which were particularly new or good. Today, I’m not disappointed that I did not choose this “gaming version” of the C64, but I’m glad that I got one of the C64G models much later. This is the end of the Commodore 64 part of the Vintage Computing series – but next week I will continue with the most amazing 8-bit computer ever made by Commodore. In closing, here are two images of the mainboard and the (in)famous packaging that had scared me away from the C64G back in 1989. This is the mainboard of the above C64G, which is identical to the one in my C64-II. Note the drastically reduced number of microchips used compared to the mainboard of the original C64. The wonderfully garish Video Supergame 64 box. Note: unlike all the other images I have used in the Vintage Computing series, I did not take this one myself. The source image is from the C64G Page of the C64 Wiki, which is licensed under the GNU Free Documentation License. Therefore, I publish this modified version of the image (perspective and colour corrected), but not the whole article, under the same license.